The Passion of Scrooge from H. Paul Moon on Vimeo. Last December 2017, I had the pleasure of taking part in a huge project in my role at principal percussionist with the 21st Century Consort. H. Paul Moon, of Zen Violence Films, worked with the Consort to create a film version of Jon Deak’s The Passion of Scrooge that was written for our ensemble. For the past many years we have performed this piece around the holidays and we always have a full house. Moon has put together a truly stunning cinematic interpretation of Deak’s piece and it is a completely unique and wonderful experience. Details about the film can be found HERE. There will be a screening of the film in Washington, D.C. on December 8 at 3:30 pm at the Smithsonian American Art Gallery before our 5 pm concert. I hope to see you there! Hey Friends, I’m gearing up for my Focus Day performance at PASIC 2017 on Thursday November 9 at 9 am in the Indianapolis Convention Center, Wabash Ballroom. I’ll be presenting Stuart Saunders Smith’s stunning marimba opera entitled The Authors. 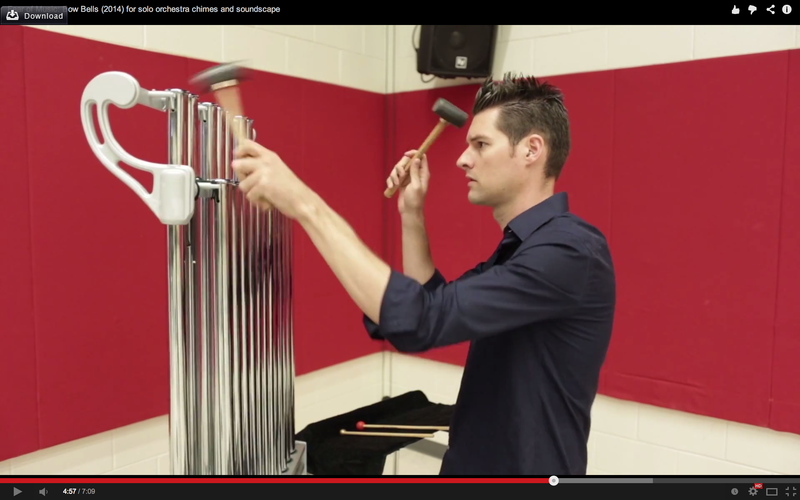 The piece asks the performer to speak, sing, and act all while playing the marimba. It’s a stunning work of art and I hope that you’ll join me for the performance. Details about the PASIC performance can be found here. The piece can be heard on my solo CD entitled “Theatrical Music for Solo Percussion” on Albany Records that I released in 2015. That CD can be found here. I recently rerecorded the piece at Stuart’s request for an upcoming five CD set of his music that will be released soon. 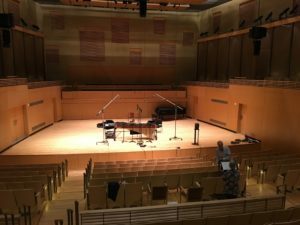 Here’s some pics from the recording session at UMBC last May 2017 with Alan Wonneberger as engineer, Sylvia Smith as narrator for the final movement of the piece, and Stuart Smith as coach and guide through the recording process. It was great to revisit the piece again for a new recording and to try some new things for the second time around. Baljinder Sekhon’s Double Percussion Concerto with Wind Ensemble video! Hey Everyone! I had the distinct pleasure of premiering this fantastic new work by Baljinder Sekhon last spring at Carnegie Hall! We did the piece at the University of South Florida last spring as well and just recently performed it at the University of Maryland. Here’s a video of the live performance to check out. Enjoy! 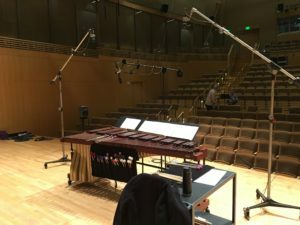 I recently wrote and premiered a new solo piece for orchestra chimes. The YouTube video can be found here with more info. Enjoy! Hanging with Pius Cheung and Marja Kerney at the Innovative Percussion booth. Congrats to Pius on the awesome new marimba mallets! PASIC 2013 was an incredible success. Thanks so much to all of the many folks involved who work tirelessly behind the scenes to make this event happen every year. Congrats to Bill Sallak and the New Music / Research Committee on an incredible series of Focus Day concerts and to the Percussion Ensemble Committee for the wonderful selection of ensembles from all over the country. I was honored to attend my first meeting at PASIC as a new member of the Percussion Ensemble committee and I’m looking forward to working with them in the future on many continuing projects and some new ideas. So good to see old friends and make some new ones. Baljinder Sekhon’s new work for Percussion Ensemble entitled “Refuge” was a standout among the many fine world premiere pieces at PASIC this year; not to mention the expert performance by Indiana Universities’ Percussion Ensemble (congrats John Tafoya and Kevin Bobo!). 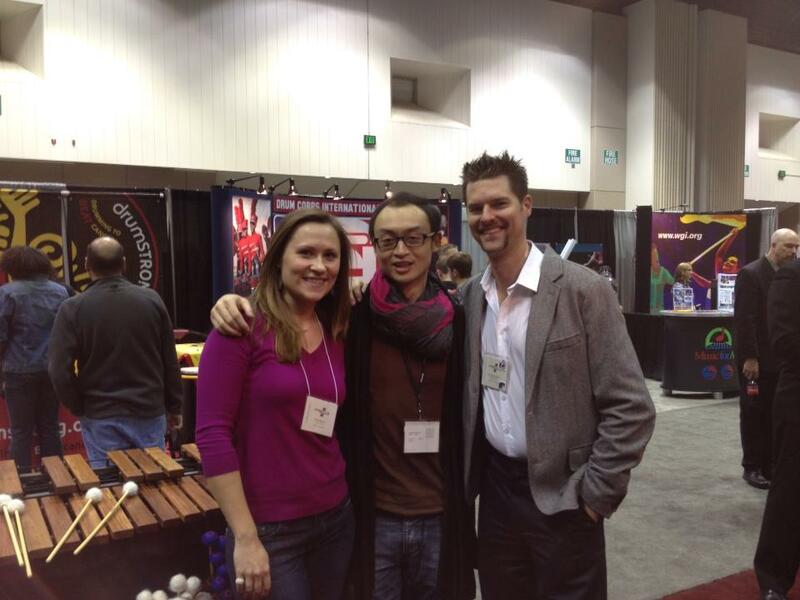 Great to see old friends Casey Cangelosi and Pius Cheung at the Innovative Percussion booth and check out their incredible new marimba mallets. Congrats to you both! Looking forward to next year’s convention. The UMD Percussion Ensemble featuring percussion students Robby Bowen (BM), Paul Keesling (MM), and Eric Plewinski traveled with Dr. Lee Hinkle by invitation to perform at the McCormick Marimba Festival in Tampa, FL at the University of South Florida February 8-9. The students were each featured as soloists at the event and the group performed an hour length concert of marimba music including movements from Elliot Cole’s Posludes for Bowed Vibraphone, Takemitsu’s Rain Tree, and Villa-Lobos’s String Quartet No. 3. 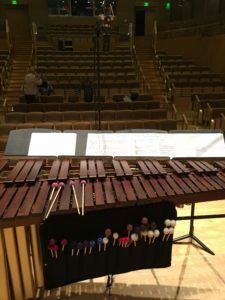 I performed Stuart Saunders Smith’s marimba opera The Authors on a special concert with the composer present and premiered a composition by Zachary Konick (BM Composition and Percussion) entitled Weaving for solo marimba. 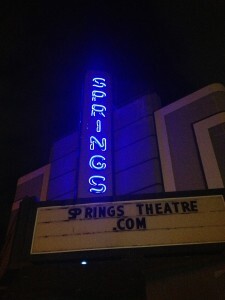 I had a chance to stick my head into the Springs Theatre too while I was in town. It was great to see the space and John Stephan again. 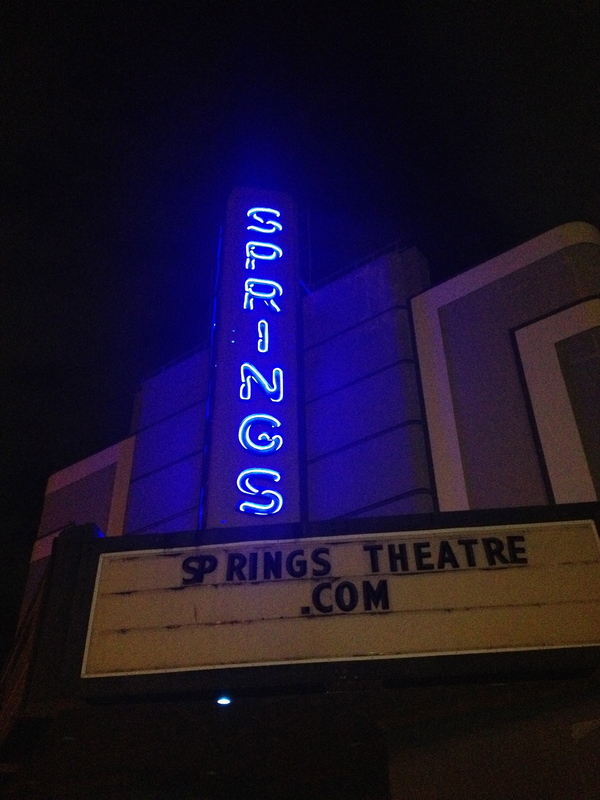 It’s been years since I’ve been to the Springs, but it is by far my favorite recording studio and a very cool space. I spent the weekend with friends and colleagues at Wright State University in Dayton, OH for the 2013 American Innovators Festival at Wright State University. We celebrated the music of Stuart Saunders Smith through a series of lectures, paper presentations, and performances. I presented a paper entitled “Theatrical Music for Solo Percussion” and performed Smith’s The Authors. What an incredible event! I learned a lot. Thanks to Stuart and Sylvia Smith, Franklin Cox, Wright State University Percussion Studio, Gerry Noble, and my sponsors Innovative Percussion and Remo Drumheads! Percussions Claviers de Lyon and Kroumata Percussion Ensemble at UMD! We have three very exciting clinics coming up at UMD that are FREE and open to the public. Please invite any and all students or colleagues you think might be interested in these great events. Dr. Hinkle has been invited to join the fine roster of artist endorsers with Grover Pro Percussion. Seasoned professionals, educators, and producers the world over consistently demand Grover Pro Percussion for their unparalleled sound, artisan craftsmanship, and world-class customer service. Check ’em out! Thanks Neil! First Half of CD in the Bag! Today I finished up mastering / editing the first half of my first solo CD “Theatrical Music for Solo Percussion.” I’ve got about 35 minutes in the bag and about about the same amount left to record. So far I’ve got Stuart Saunders Smith’s The Authors and Georges Aperghis’s Le Corps a Corps. Next sessions will be in January at which time I’ll be recording Dan Adam’s work for solo vibraphone and metal percussion with spoken and sung voice entitled Of a Just Content, Stuart Saunders Smith’s work Tunnels, and my new work for solo vibraphone entitled Vibratissimo.